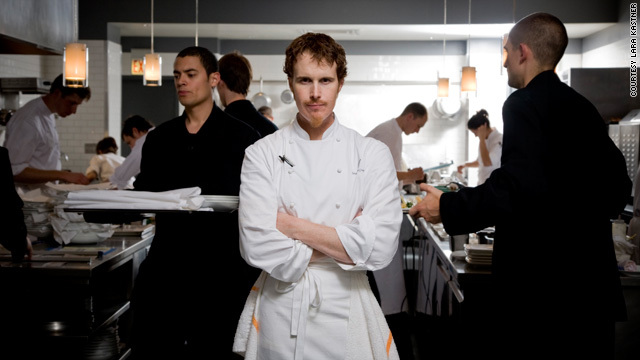 Grant Achatz's restaurant Alinea opened in Chicago, Illinois, in May 2005. (CNN) -- Acclaimed chef Grant Achatz once said he would rather die than lose his tongue. That was the possibility he faced less than three years ago. With a diagnosis of advanced squamous cell carcinoma, a kind of skin cancer, doctors recommended taking out three-fourths of his tongue and replacing it with a piece of his own arm tissue. It would look natural, but he would lose the sensation on which his entire career was based: taste. Monday, Achatz's restaurant Alinea won a prestigious James Beard Foundation award for outstanding service, which is the fifth recognition from the foundation that Achatz and his restaurant have received. S. Pellegrino's annual "World's 50 Best Restaurants" list recently named Alinea the seventh best restaurant in the world and the best in North America. "You just have to have a creative approach and want to take the risk to do something different and think outside the box," Achatz said of the restaurant's menu, which includes more than a dozen courses of artful dishes. The chef, who dreamed up plates served on aromatic pillows and chocolate desserts that look like paintings on the table, beat his cancer the same way: by challenging traditional approaches. Achatz's symptoms started in 2004 with a single white dot on the side of his tongue, which seemed like a mere nuisance. As cancer began to take over the skin on his tongue, he received several misdiagnoses from physicians and dentists. In the meantime, in 2005, at 31 years old, he opened Alinea and developed a reputation for innovative modern food style. He kept searching for an explanation for his worsening condition; he was losing weight and had trouble tasting, chewing and swallowing. Finally, in 2007, he was referred to an oral surgeon who diagnosed stage IVb cancer; there is no stage V, Achatz learned. The tumor took up more than half of the visible part of his tongue and had spread to his lymph system. "You're 32 years old; you're a young, fit, healthy man, never smoked a cigarette in your life, never a heavy drinker, no genetic risks, and you're a chef, and somehow there's that irony of coming down with a relatively rare type of cancer and then having it be tongue cancer," he said. "You gather your composure and figure out what you have to do." Doctors at four institutions told him they recommended removing the majority of his tongue and then administering chemotherapy and radiation. They told Achatz that if he didn't undergo the surgery, he would die. Over and over again, Achatz said no; he would take his chances and find an alternative. "It's just shocking to me how many people don't do that," he said. "It's sad, because I think people have this conception that when a doctor says something, that's the golden standard; they're always right. And in fact, they're not always right." At the University of Chicago Medical Center, Achatz found a doctor who shared his way of challenging convention. Oncologist Dr. Everett Vokes first gives chemotherapy and radiation to patients with Achatz's cancer and uses surgery if that fails. Today, Vokes agrees that his work has something in common with Achatz's. "Molecular cuisine is in some ways quite related to what we do in our treatment, which is to find the right ingredients and bring them together for the better -- not for taste but for a more effective cancer therapy," Vokes said. "In that sense, he could always relate to what we were doing: coming up with the best combination." Achatz wasn't just unusual as a patient because of his culinary talent; he was also 33 and had no obvious risk factors for cancer, Vokes said. Squamous cell carcinoma more commonly affects elderly people with a history of tobacco and alcohol use, said Dr. Jeffrey Myers, professor of head and neck surgery at the University of Texas M.D. Anderson Cancer Center, who did not treat Achatz. More than 30,000 cases of oral cancer are diagnosed each year, according to the Centers for Disease Control and Prevention. Nonetheless, Vokes' team of oncologists treated Achatz as if he were a typical patient, giving him chemotherapy and radiation first. Had the tumor grown, they might have done surgery, Vokes said. Trying other treatments such as chemotherapy first, to see whether surgery is necessary, can be risky because the tumor can grow in the interim, Myers said. But quality of life goes down for most people who have this operation, he said. Some patients lose their ability to swallow and talk; others find new ways to do these basic functions. "You lose a huge part of what makes us human," Vokes said. Although surgery has been the standard of care for this kind of cancer, the organ-preservation approach has become more common in the last three decades, Myers said. Achatz underwent chemotherapy and radiation without surgery, and the side effects were grueling. With whatever food he could swallow, he had nausea. The skin on his tongue shed like snakeskin. He could no longer taste. "Imagine putting a spoonful of something in your mouth and not being able to discern anything; it's purely just the texture," he said. "It's a bizarre sensation, because you lose all motivation to eat." Still, Achatz showed up for work nearly every day, except for 14 days at the end of his treatment. His business partner, Nick Kokonas, and girlfriend, Heather Sperling, helped him through this time, but he worried about the future of Alinea: Would the guests quit coming because of his illness? Would the staff freak out and quit? The restaurant itself was his solace. "I couldn't think of anywhere I'd rather be than right here to get that support and just to feel comfortable," he said. "That's where I spend all my time; it's my passion; it's what motivates me; it's what keeps me going." At the end of the treatment in 2007, he had dropped from 170 to 128 pounds and could barely talk or taste. But the chemotherapy and radiation worked: Achatz's cancer was gone and hasn't returned. Statistically, tumors of this kind recur early; 2½ years of being cancer-free is a good sign that it won't come back, Vokes said. Taste came back to Achatz slowly, in fragments, over the next year. After the first three months, he became able to taste only sweet, and then three months later he could detect salt. Toward the end of the year, he began to taste bitter and acidic components of foods. Although he's able to enjoy flavors again, Achatz knows he will suffer a lifetime of side effects. The radiation made swallowing difficult, as if something is caught in the back of his throat, and the skin inside his mouth is thinner than normal, making him sensitive to extreme hot or cold temperatures. He also has mobility issues with his neck. But all of this is far better than the alternative, he said. Achatz has received numerous e-mails from people who have heard about his situation and felt empowered to be their own advocates. He encourages other cancer patients to do the same. "People have to understand that hospitals are businesses; doctors -- yes, they do great things and they might save your life and make you feel better -- but at the end of the day, they're working just like anyone else," he said. "If you don't like what you're being told, try to find something that feels right to you."